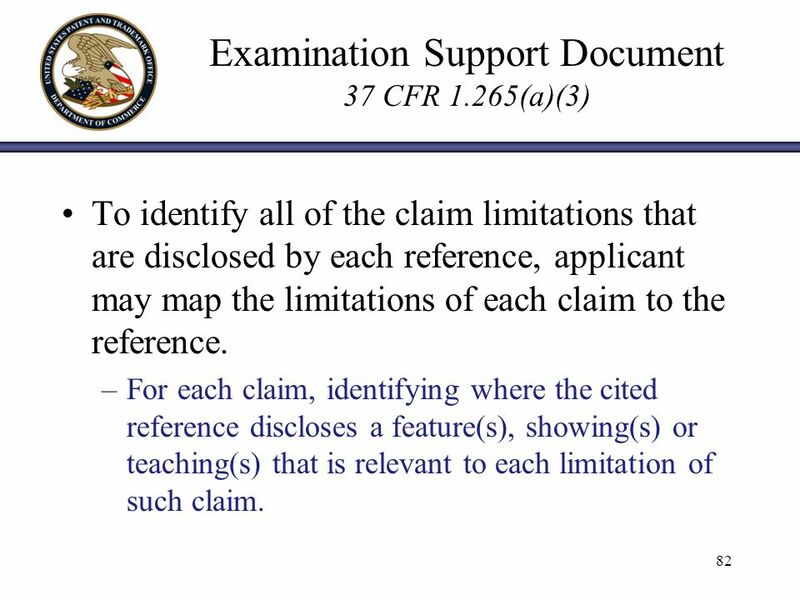 Claims and Continuations Final Rule For users of assistive technology, additional information about visual elements within the presentation is provided. 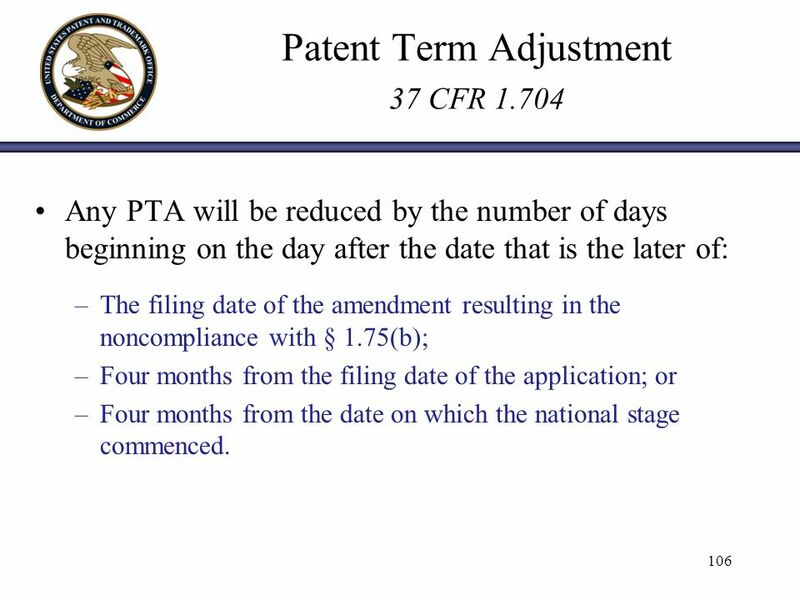 2 2 Background In January of 2006, the Office proposed rule changes to practice for: –Continued examination filings; –Patent applications containing patentably indistinct claims; and –Examination of claims in patent applications. 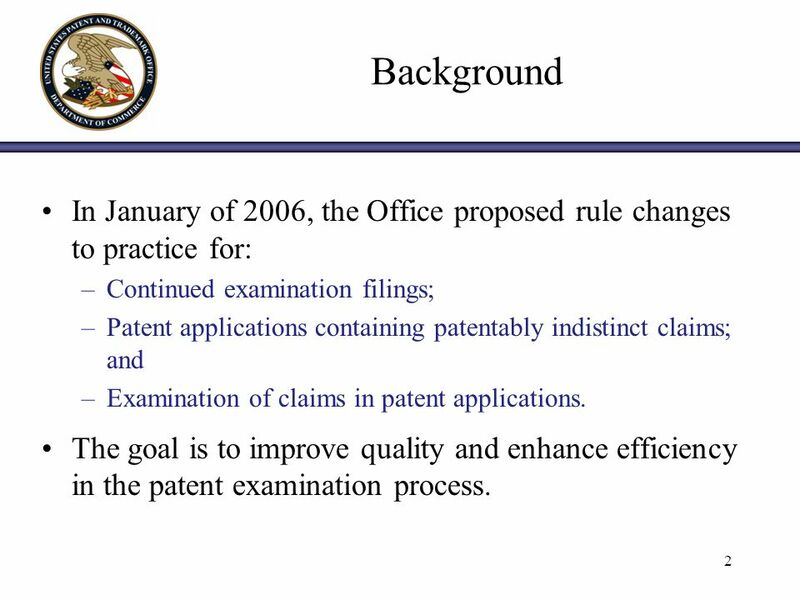 The goal is to improve quality and enhance efficiency in the patent examination process. 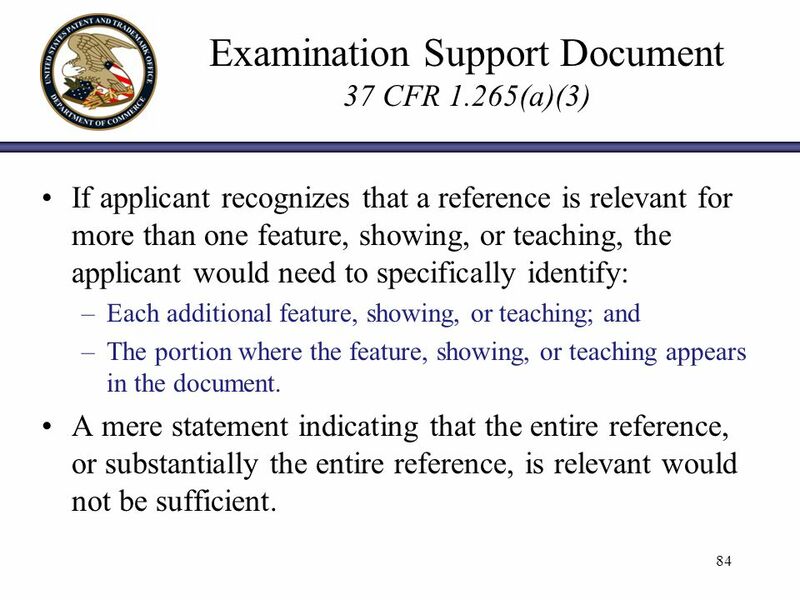 3 3 Background The Office provided an extended comment period to ensure that the public would have sufficient time to submit written comments on the proposed changes. 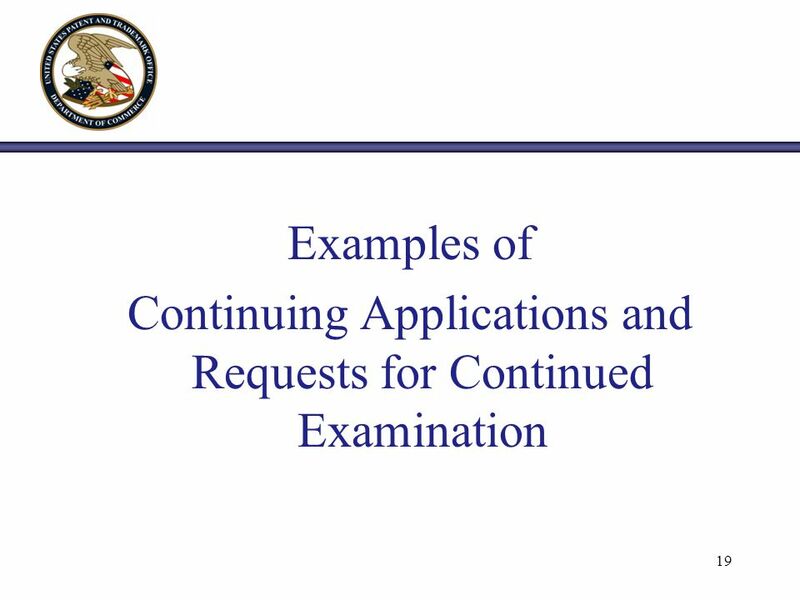 The Office also conducted town hall meetings and presentations at various locations in the United States. 4 4 Background The Office received over 500 written public comments, –From intellectual property organizations, companies, law firms, inventors, universities, and government agencies. 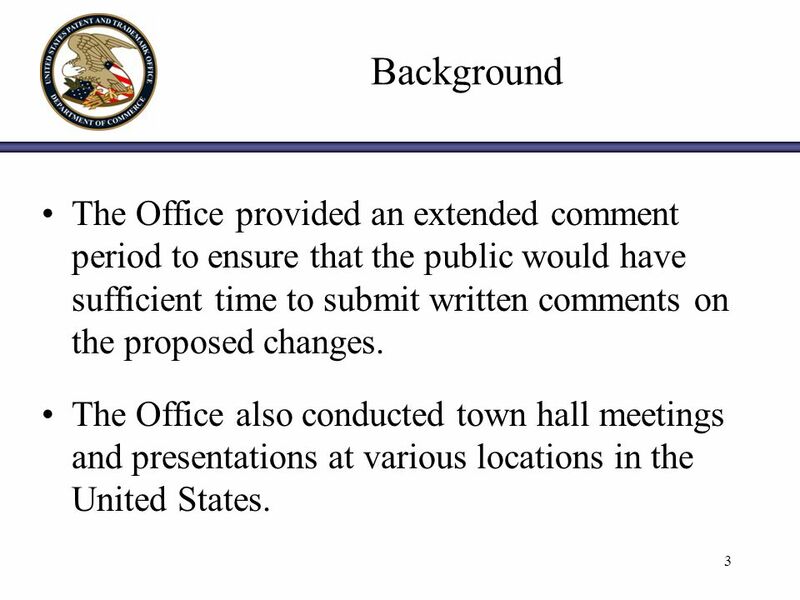 The Office carefully analyzed and considered the public comments. The Office has made appropriate modifications to the proposed rule changes in response to the public comments. 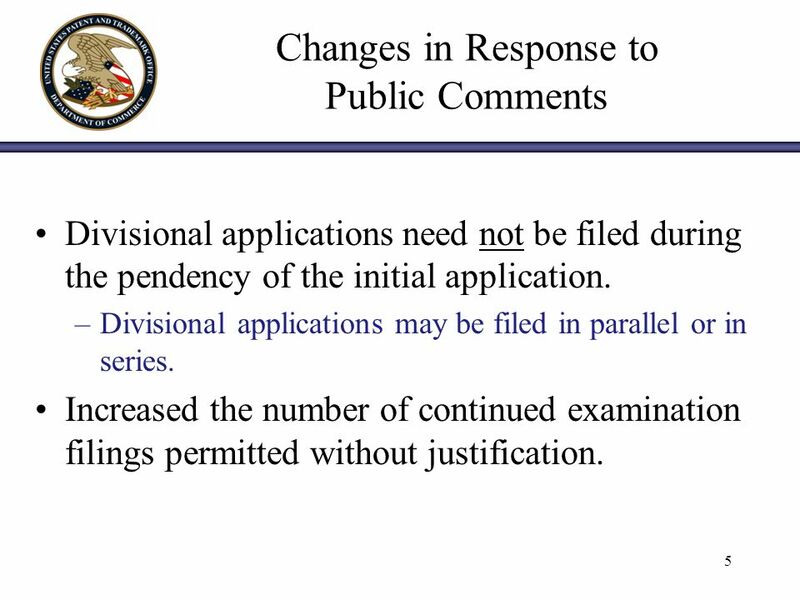 5 5 Changes in Response to Public Comments Divisional applications need not be filed during the pendency of the initial application. 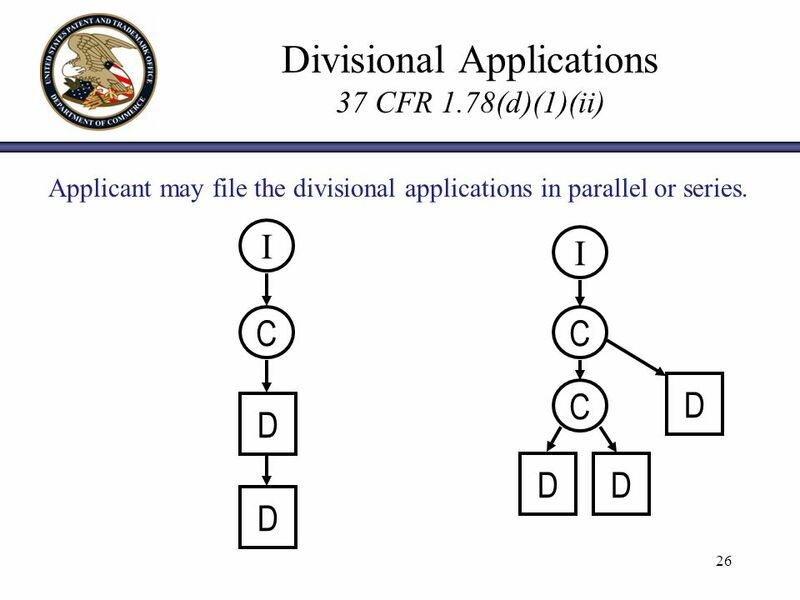 –Divisional applications may be filed in parallel or in series. 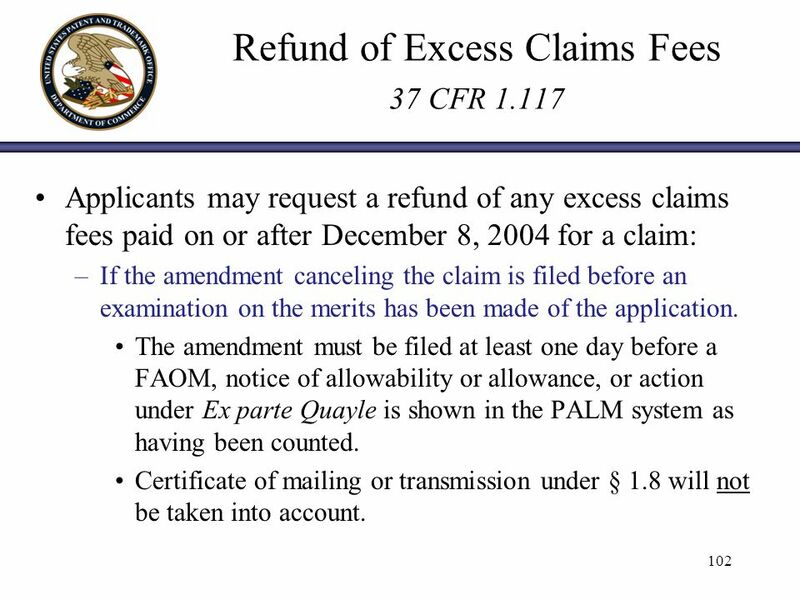 Increased the number of continued examination filings permitted without justification. 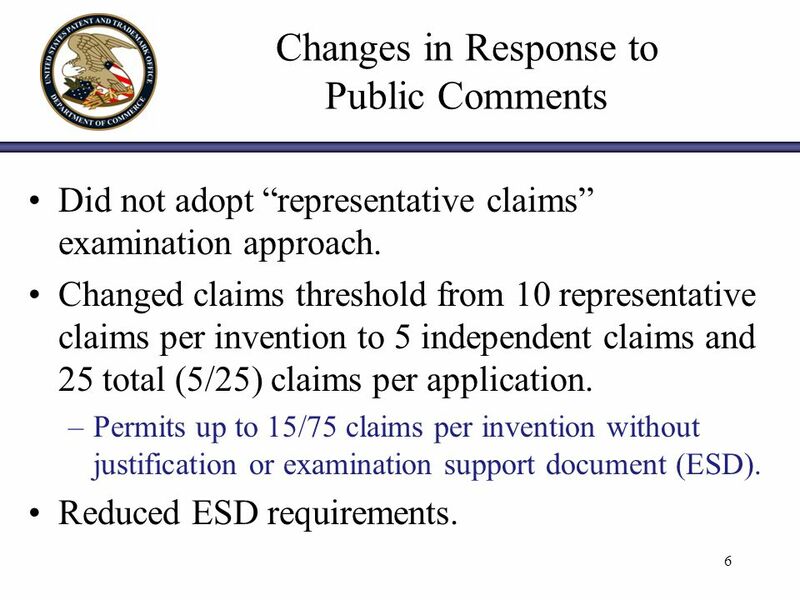 6 6 Changes in Response to Public Comments Did not adopt representative claims examination approach. 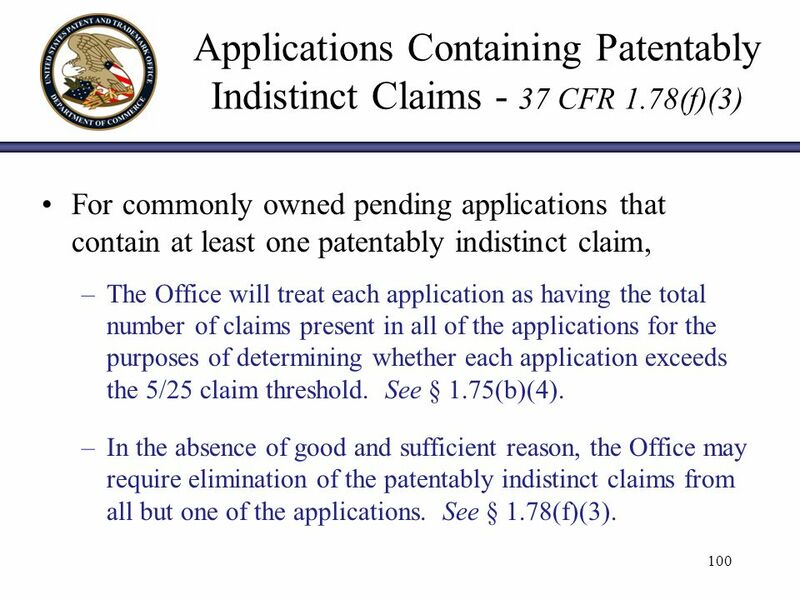 Changed claims threshold from 10 representative claims per invention to 5 independent claims and 25 total (5/25) claims per application. 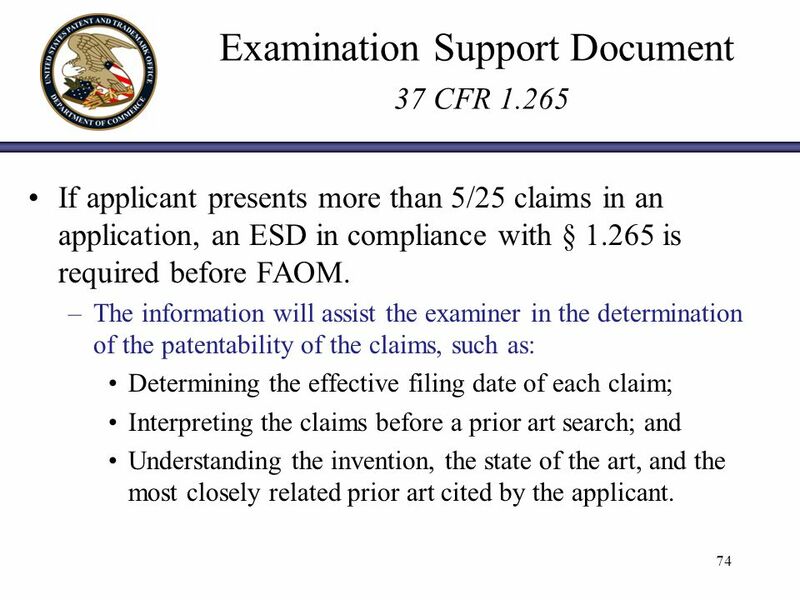 –Permits up to 15/75 claims per invention without justification or examination support document (ESD). 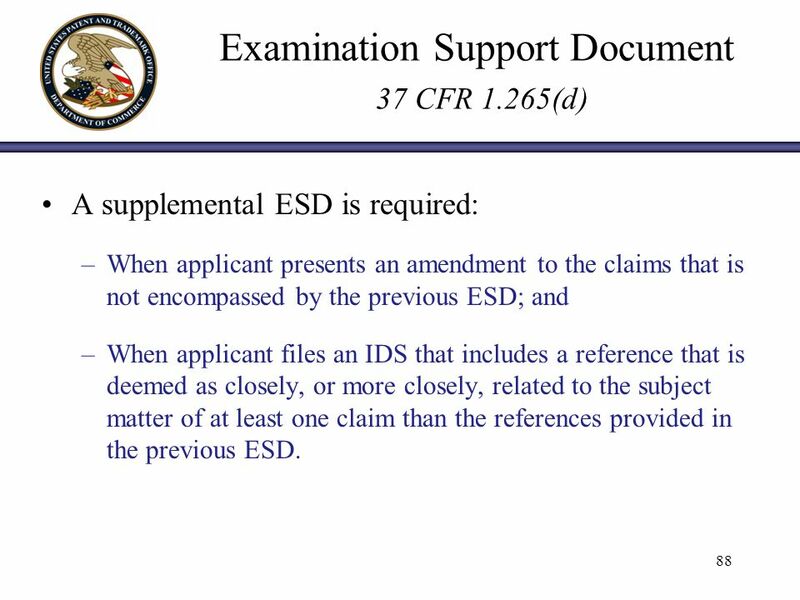 Reduced ESD requirements. 7 7 Claims and Continuations Final Rule The Claims and Continuations Final Rule was published on August 21, 2007, in the Federal Register. 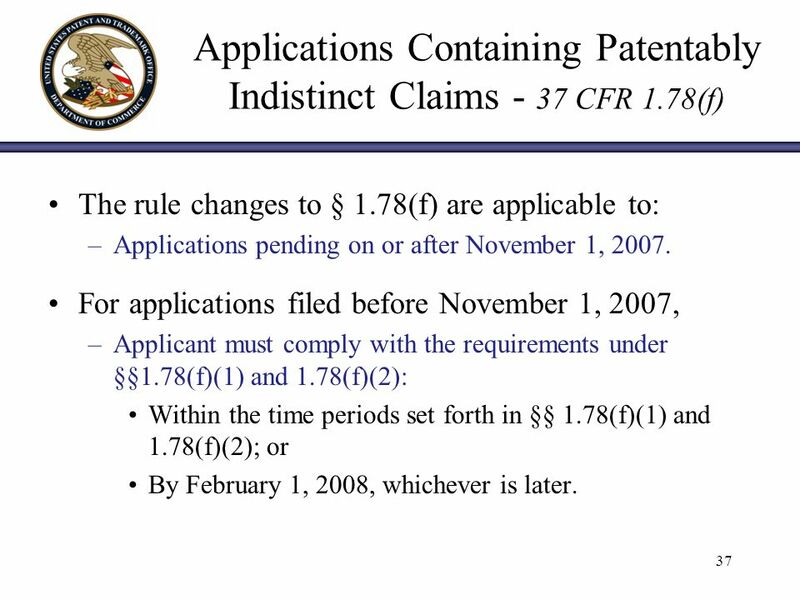 –Changes to Practice for Continued Examination Filings, Patent Applications Containing Patentably Indistinct Claims, and Examination of Claims in Patent Applications, 72 FR 46716 (August 21, 2007) (final rule). –The final rule is available on the USPTO web site at www.USPTO.gov. The effective date is November 1, 2007. 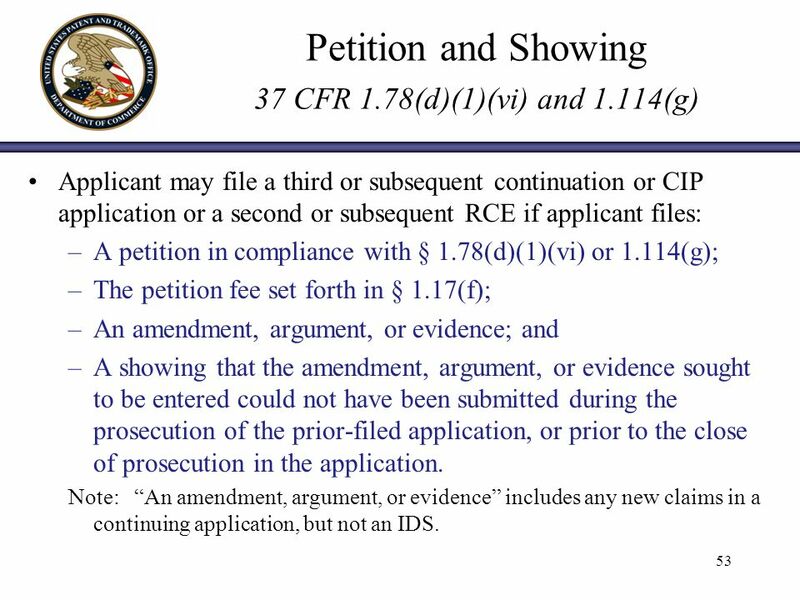 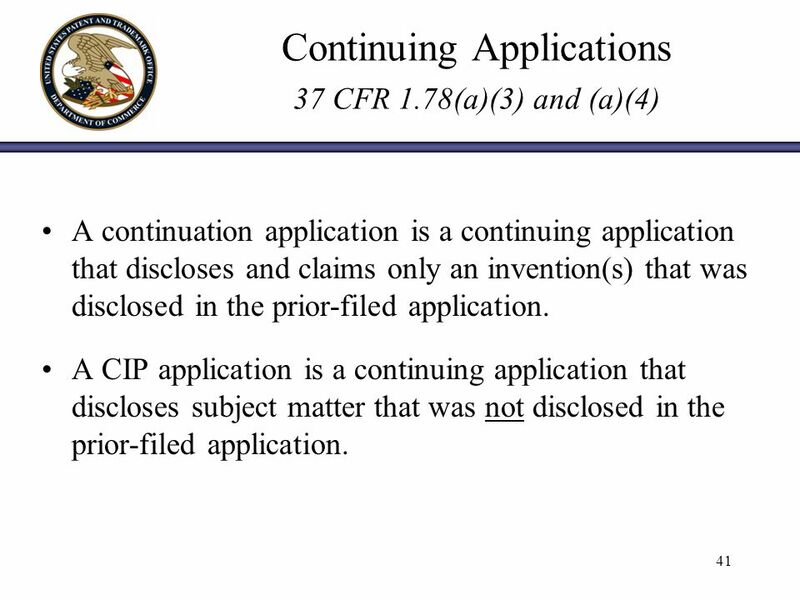 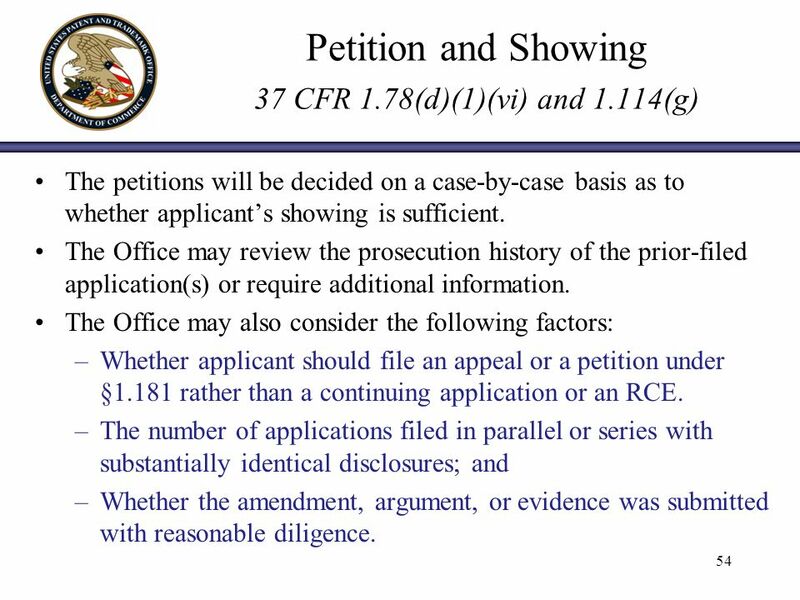 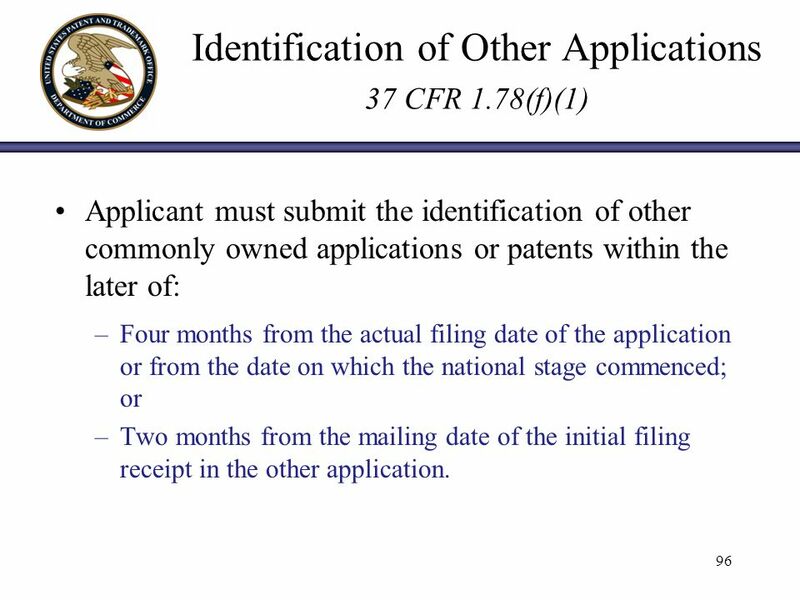 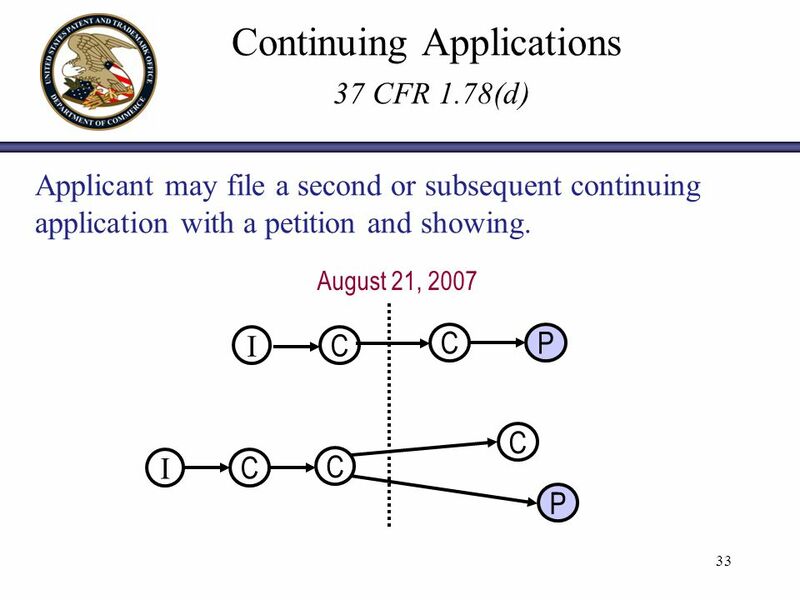 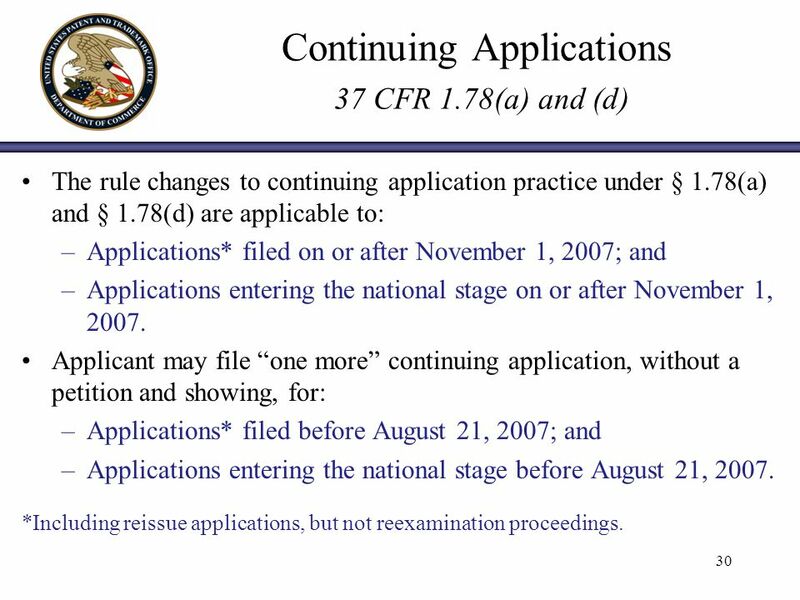 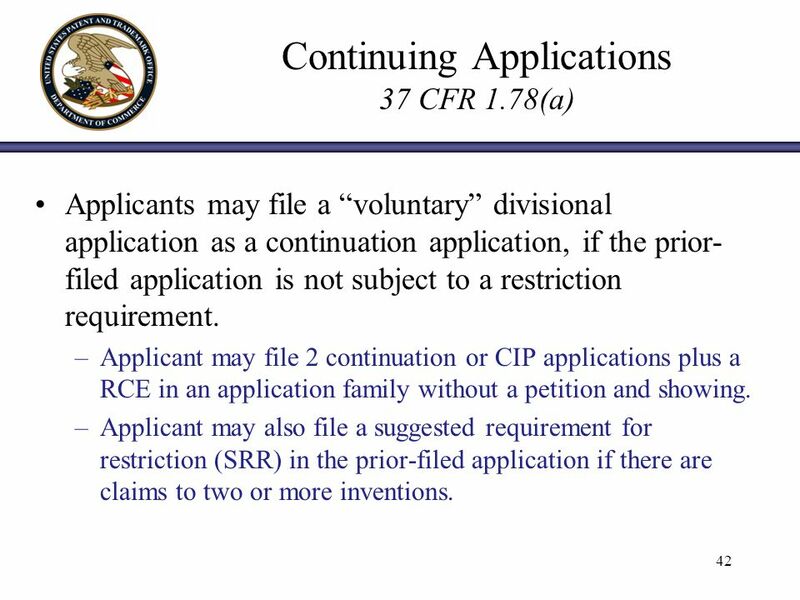 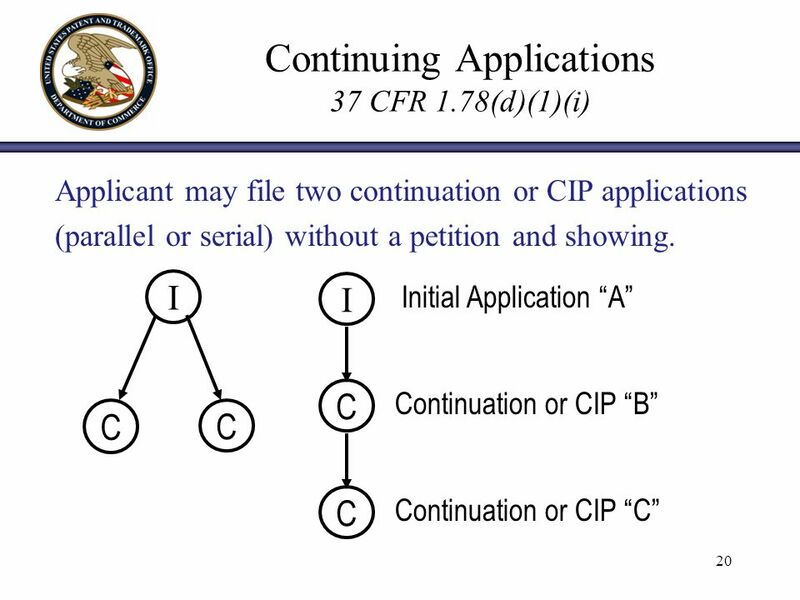 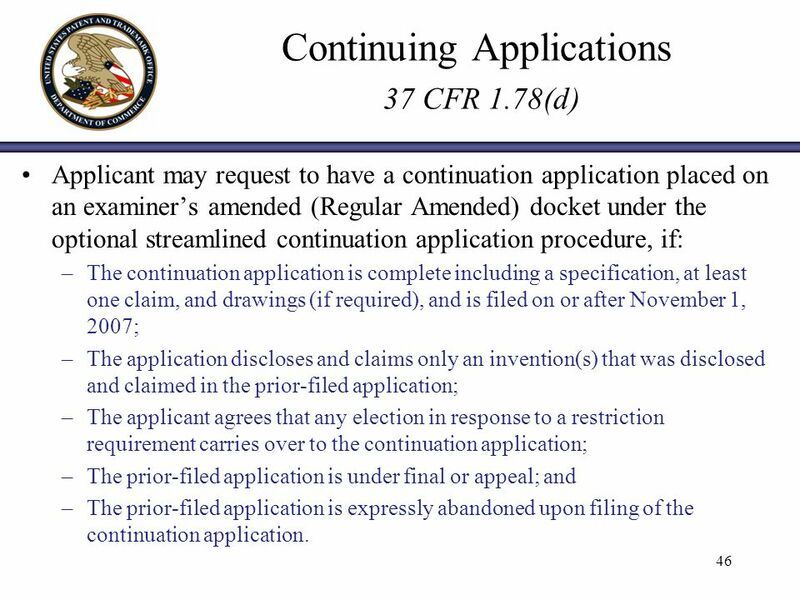 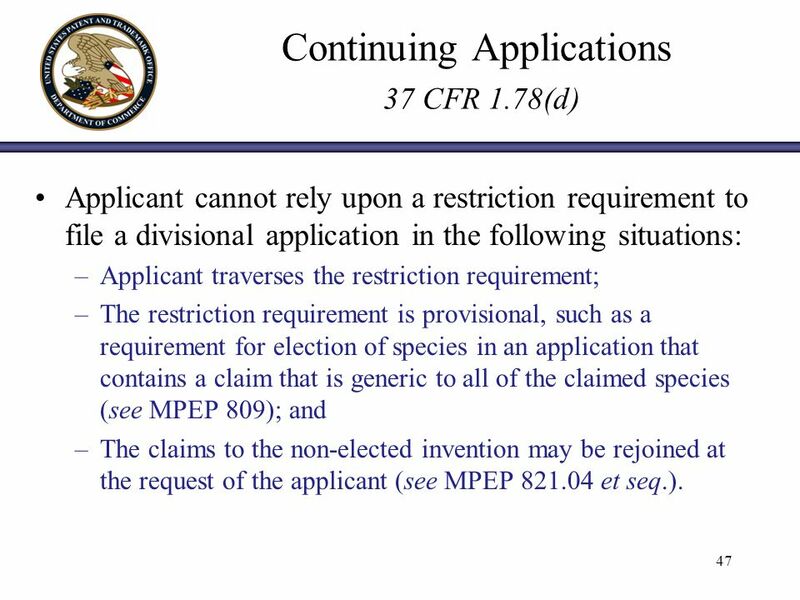 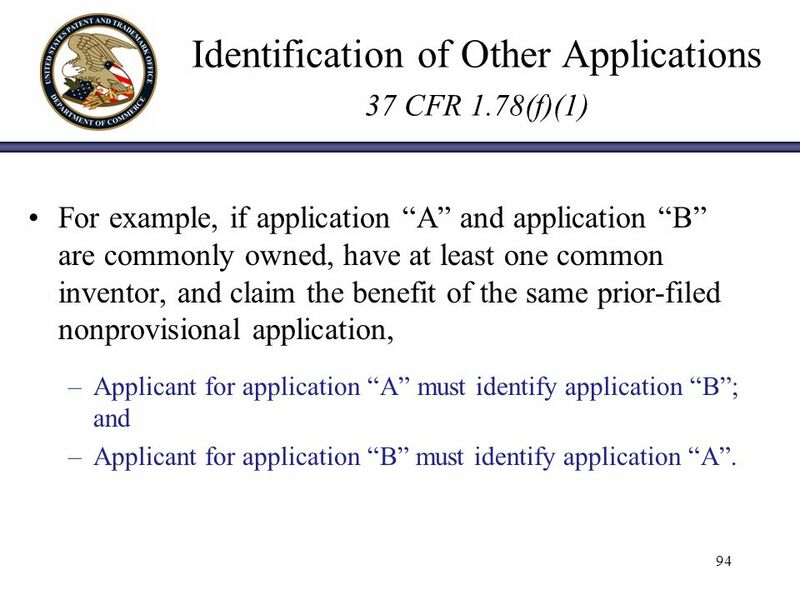 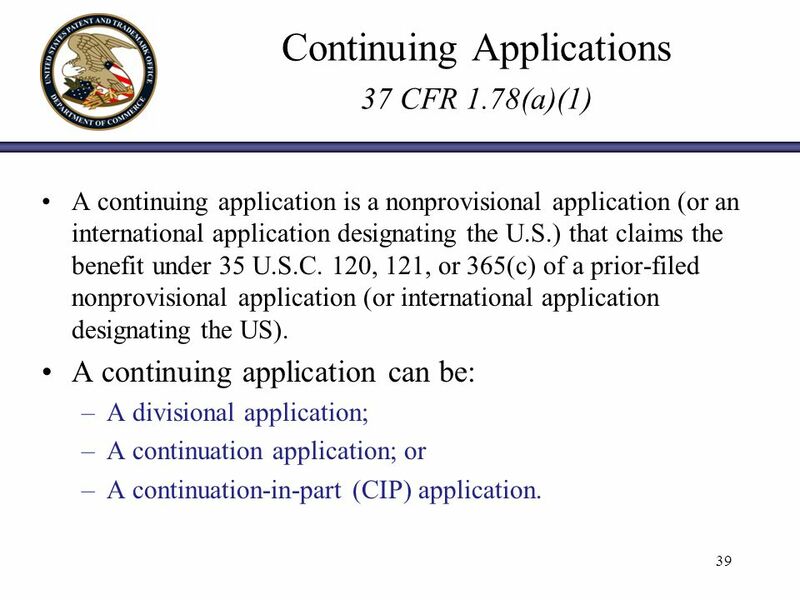 20 20 Continuing Applications 37 CFR 1.78(d)(1)(i) I C I C C C Initial Application A Continuation or CIP B Continuation or CIP C Applicant may file two continuation or CIP applications (parallel or serial) without a petition and showing. 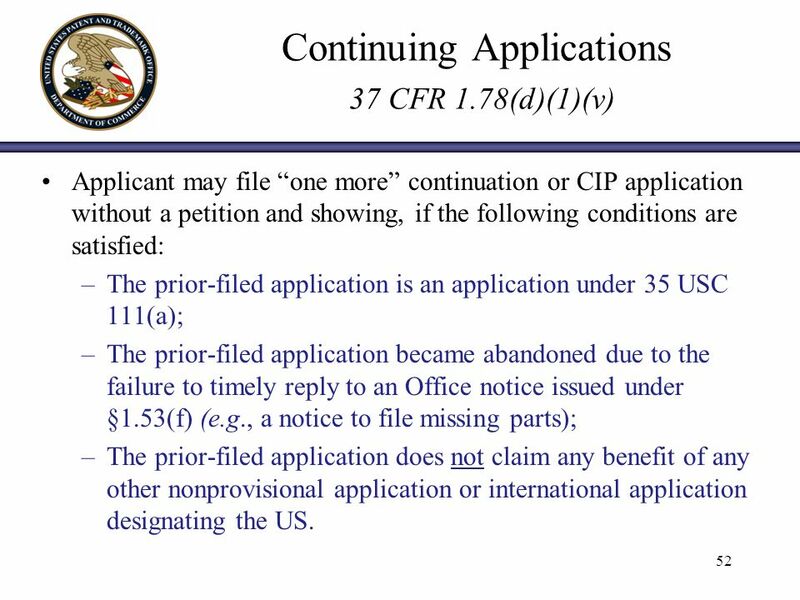 21 21 Continuing Applications 37 CFR 1.78(d)(1)(vi) I C I C C C P P Initial Application A CON or CIP B CON or CIP C Continuation or CIP with a petition and showing Applicant may file a third or subsequent continuation or CIP application with a petition and showing. 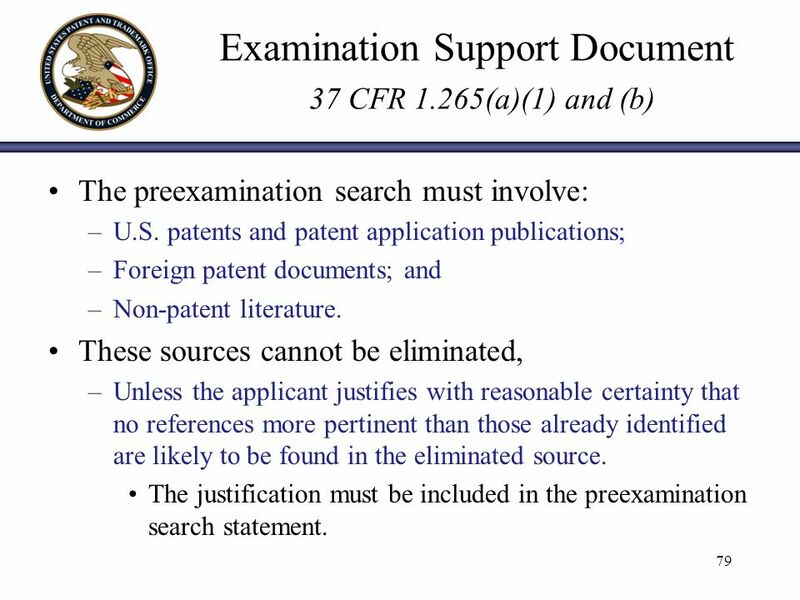 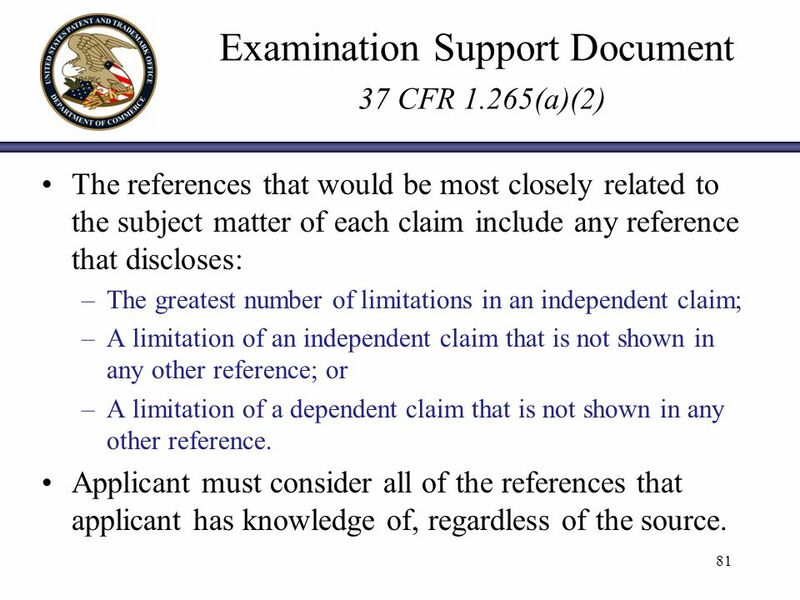 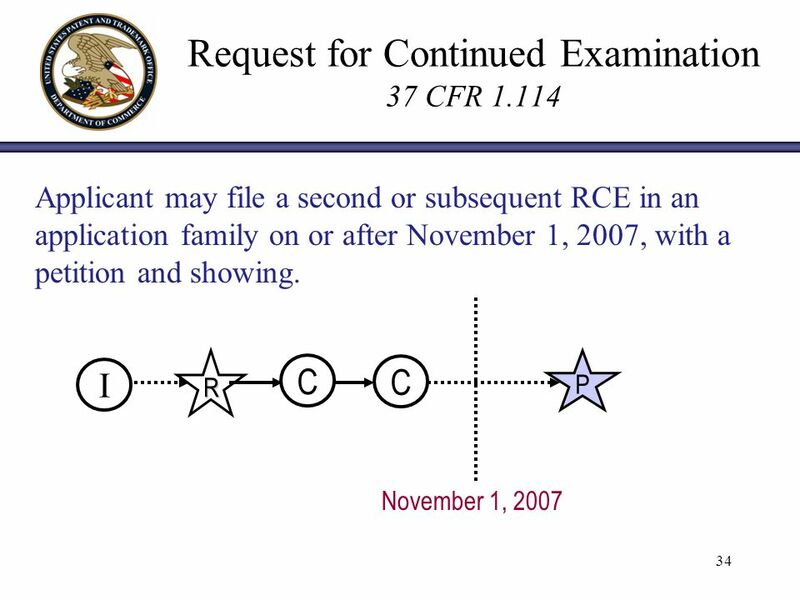 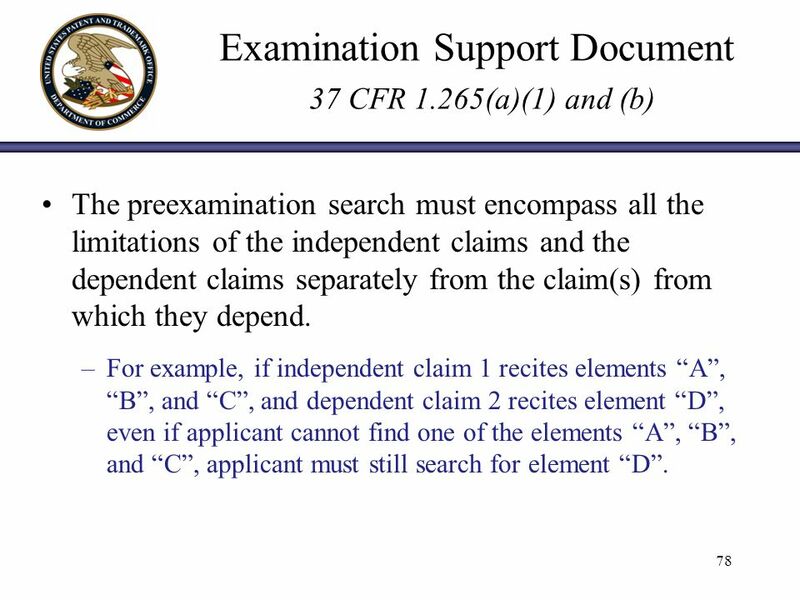 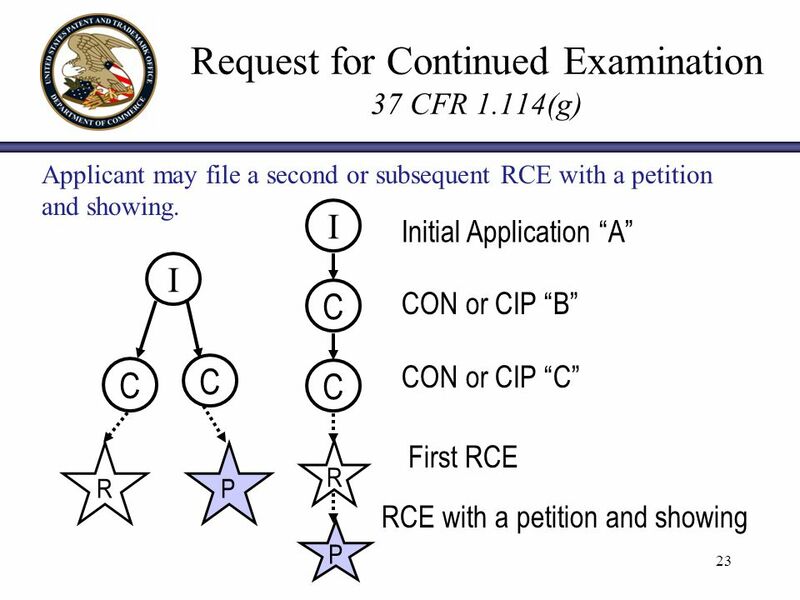 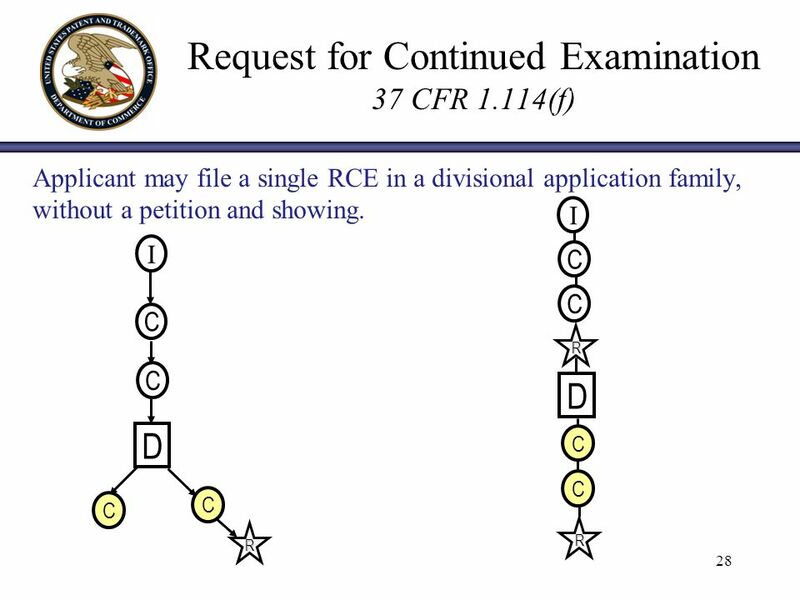 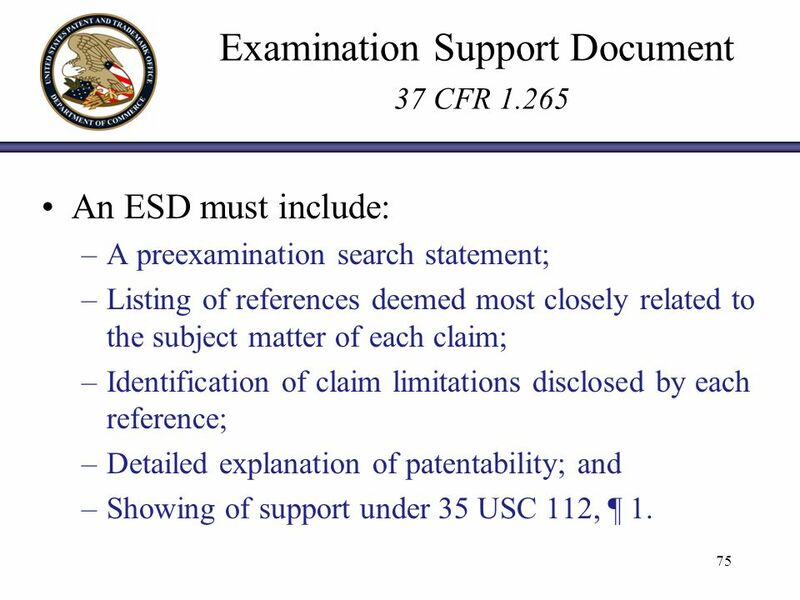 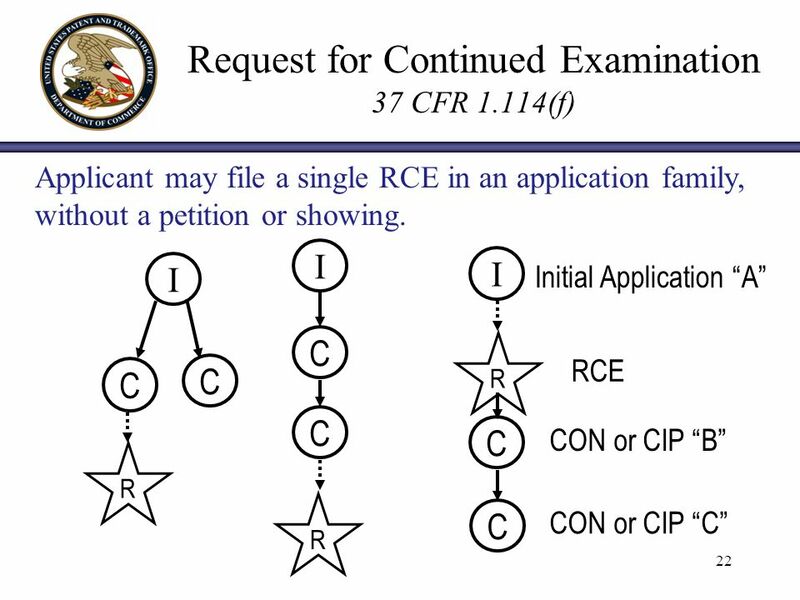 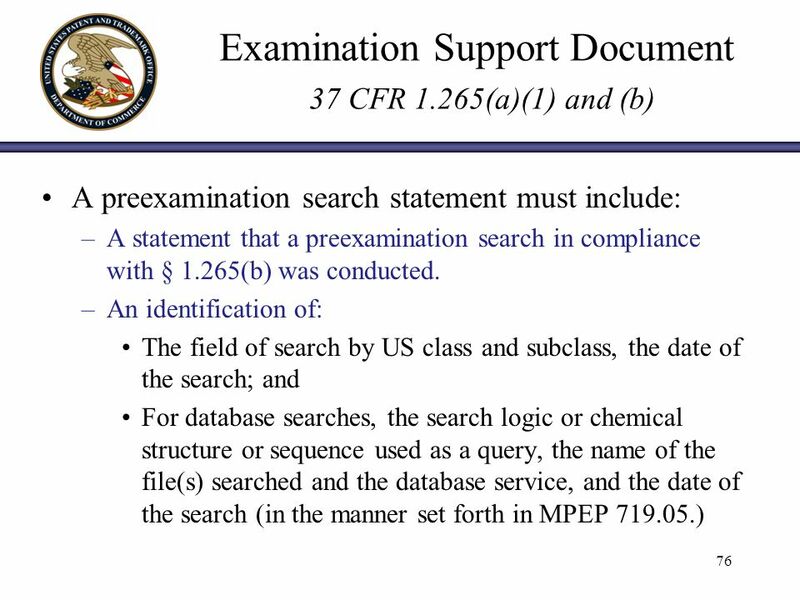 22 22 Request for Continued Examination 37 CFR 1.114(f) I C I C C C I C C R R R Initial Application A RCE CON or CIP B CON or CIP C Applicant may file a single RCE in an application family, without a petition or showing. 23 23 Request for Continued Examination 37 CFR 1.114(g) I C I C C C R RP P CON or CIP B CON or CIP C First RCE RCE with a petition and showing Initial Application A Applicant may file a second or subsequent RCE with a petition and showing. 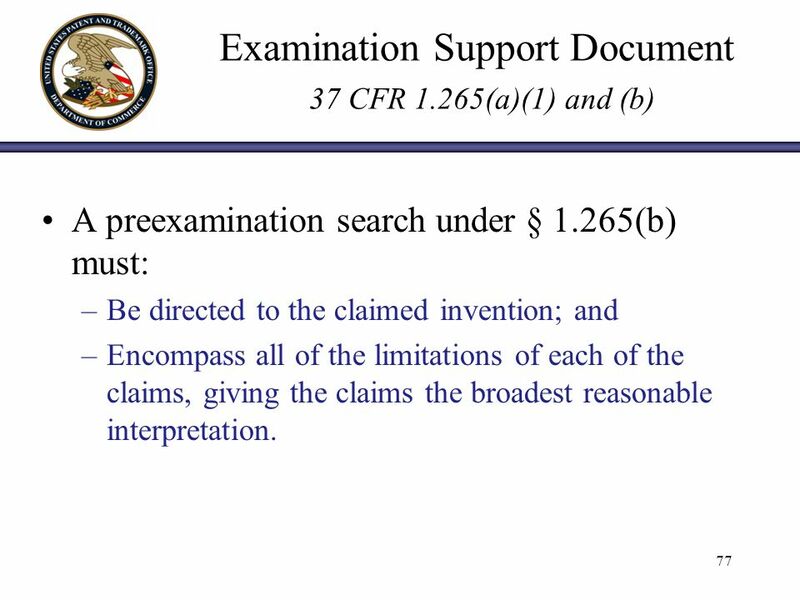 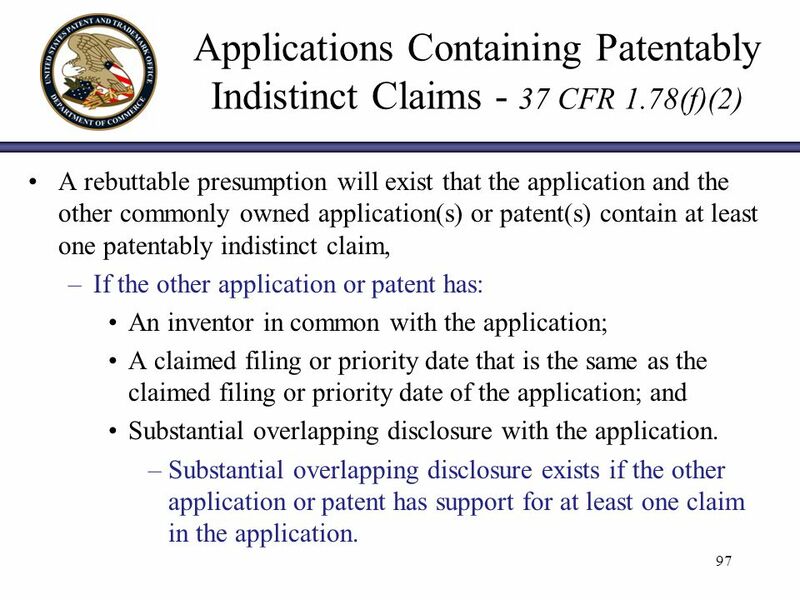 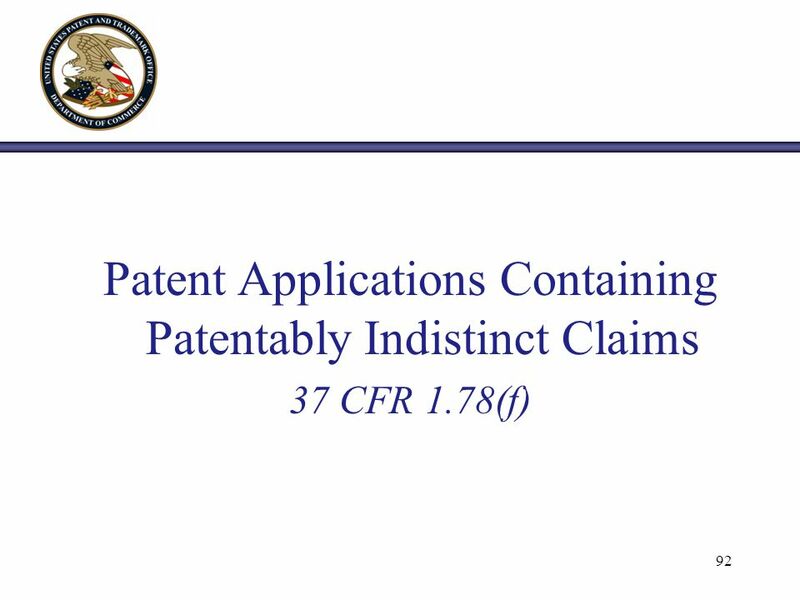 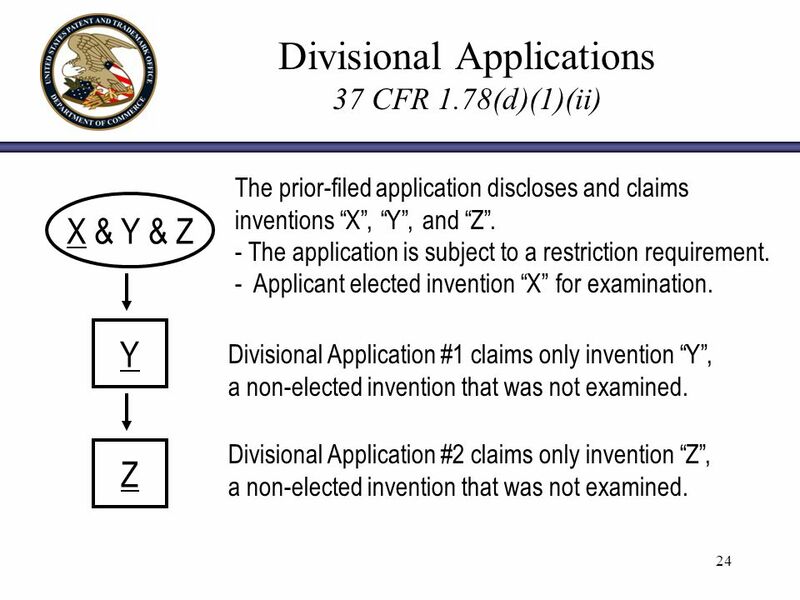 24 24 Divisional Applications 37 CFR 1.78(d)(1)(ii) X & Y & Z Y The prior-filed application discloses and claims inventions X, Y, and Z. - The application is subject to a restriction requirement. 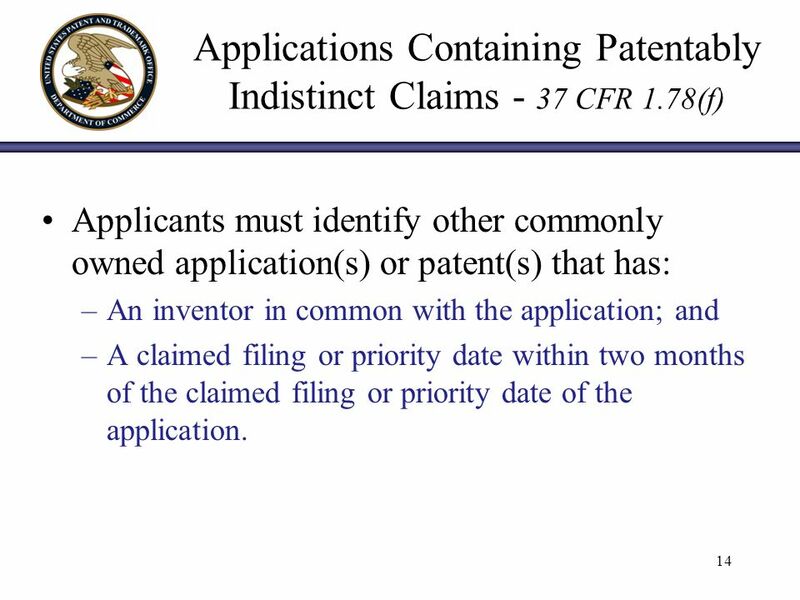 - Applicant elected invention X for examination. 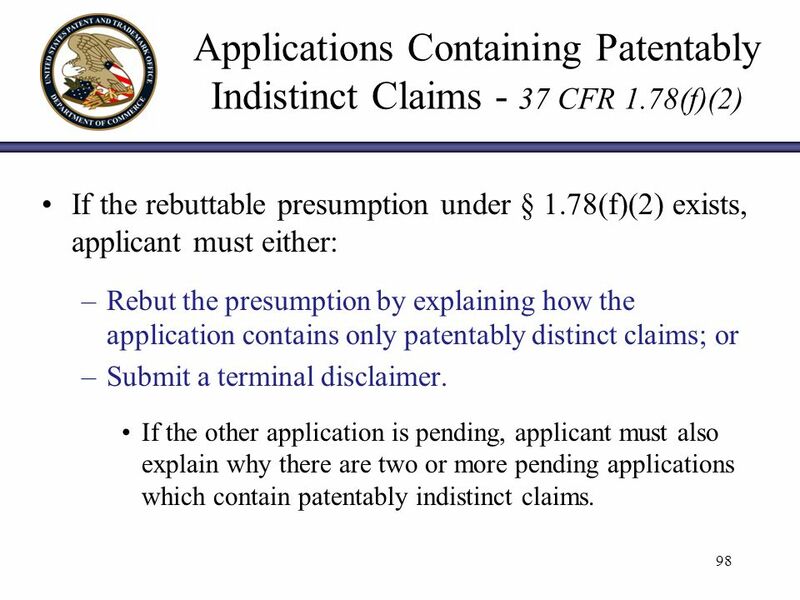 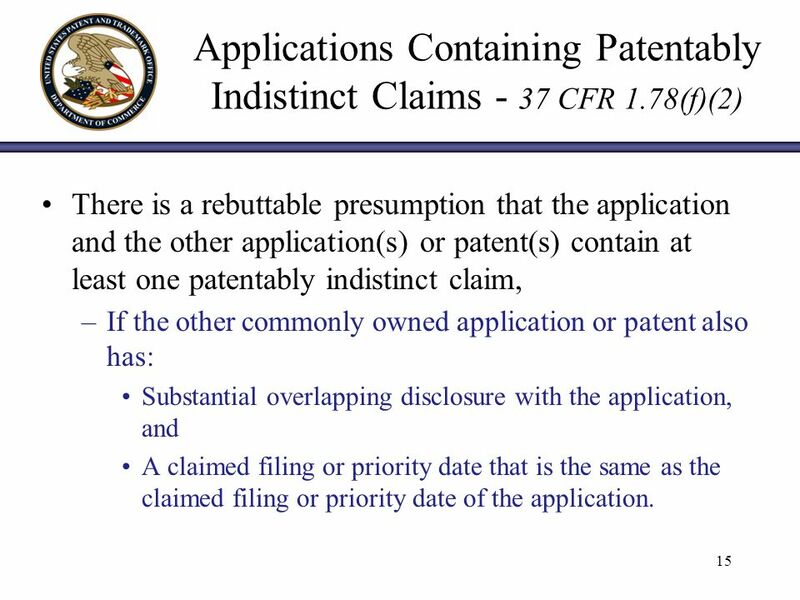 Divisional Application #1 claims only invention Y, a non-elected invention that was not examined. 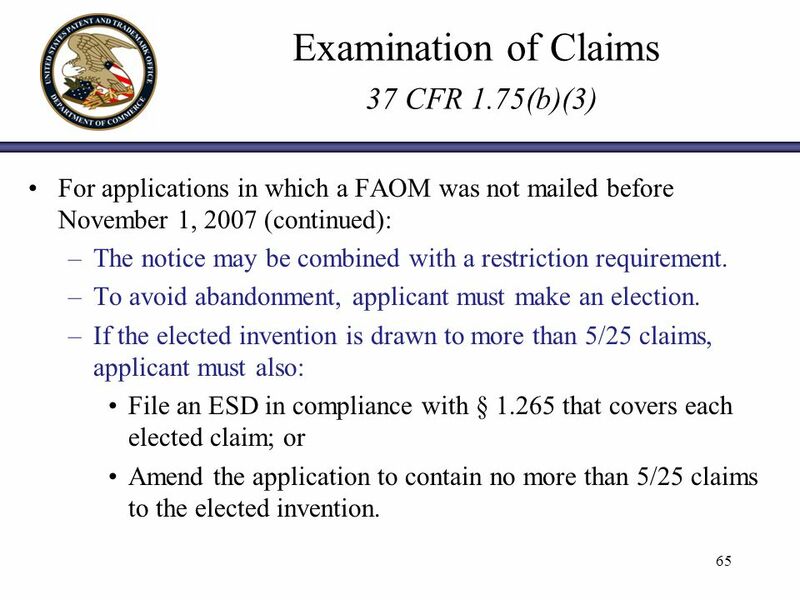 Z Divisional Application #2 claims only invention Z, a non-elected invention that was not examined. 25 25 Divisional Applications 37 CFR 1.78(d) and 1.114(f) I C C D R Initial application A w/ restriction requirement CON or CIP C RCE Divisional application D CON or CIP B A divisional application is not required to be filed during the pendency of the initial application, as long as the copendency requirement of 35 USC 120 is met. 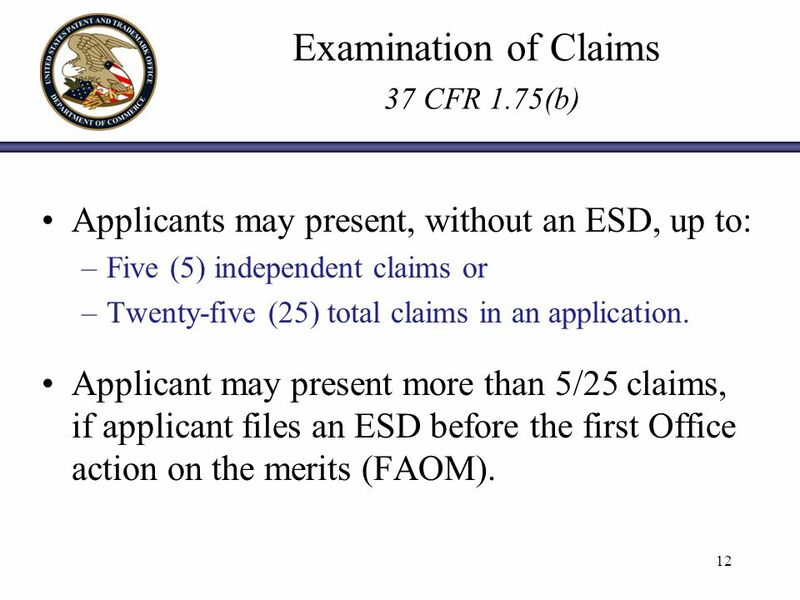 26 26 Divisional Applications 37 CFR 1.78(d)(1)(ii) I C C I C D D DD D Applicant may file the divisional applications in parallel or series. 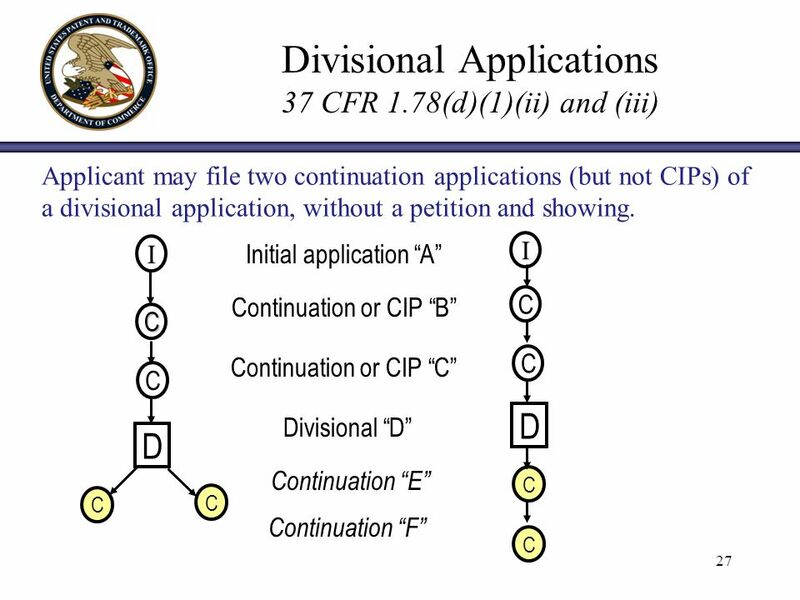 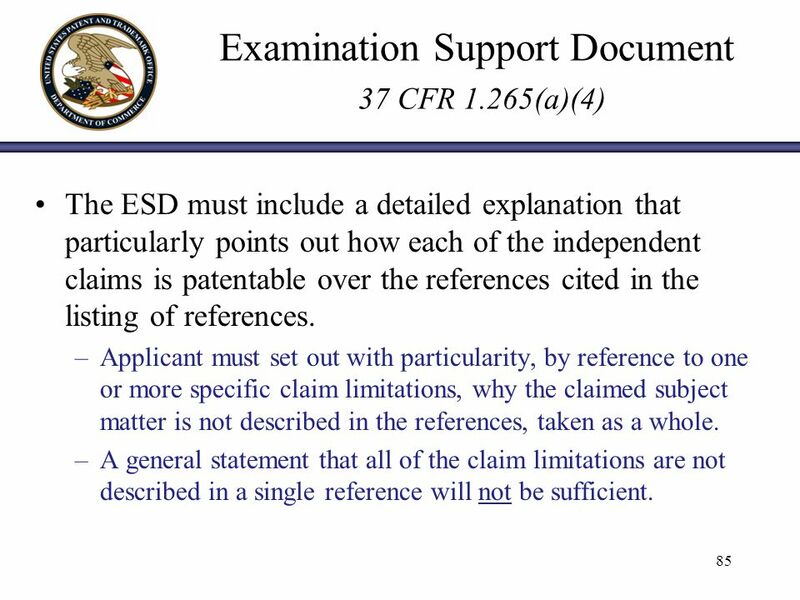 27 27 Divisional Applications 37 CFR 1.78(d)(1)(ii) and (iii) I C C C C D I C C D Initial application A Continuation F Continuation E Continuation or CIP C Continuation or CIP B Divisional D C C Applicant may file two continuation applications (but not CIPs) of a divisional application, without a petition and showing. 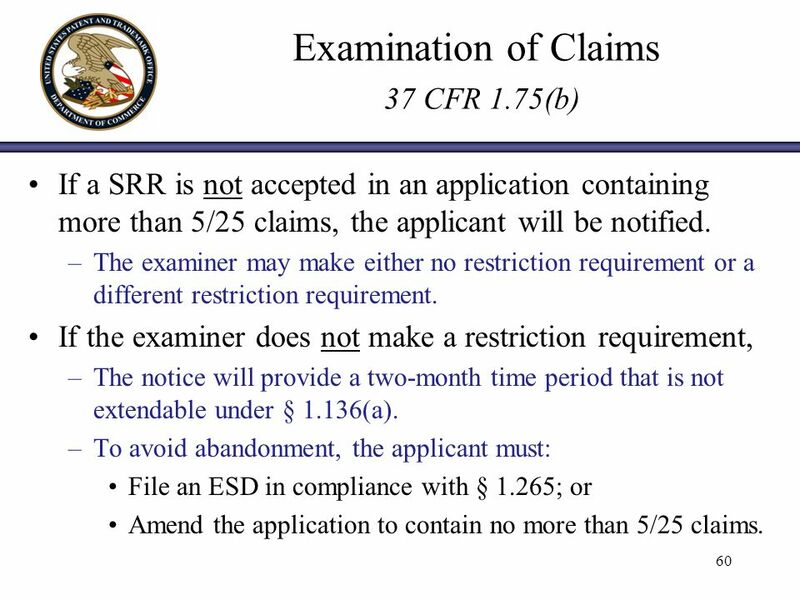 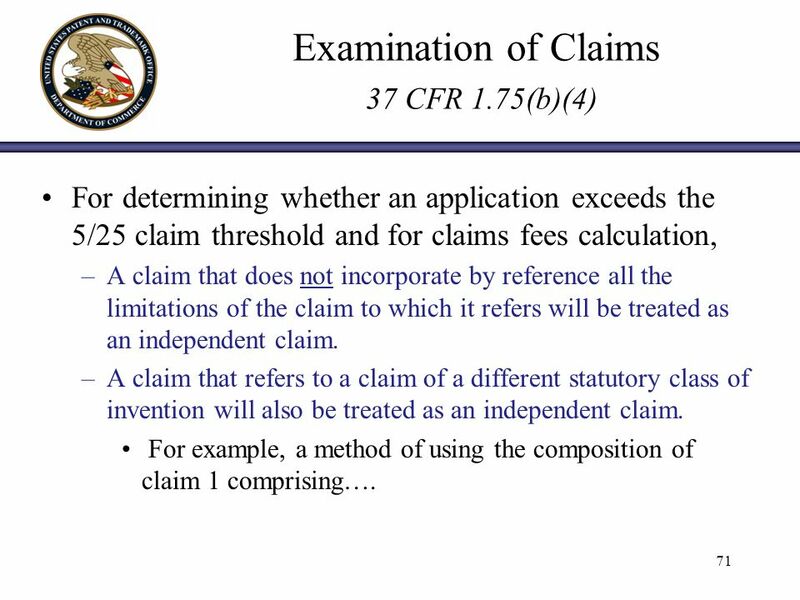 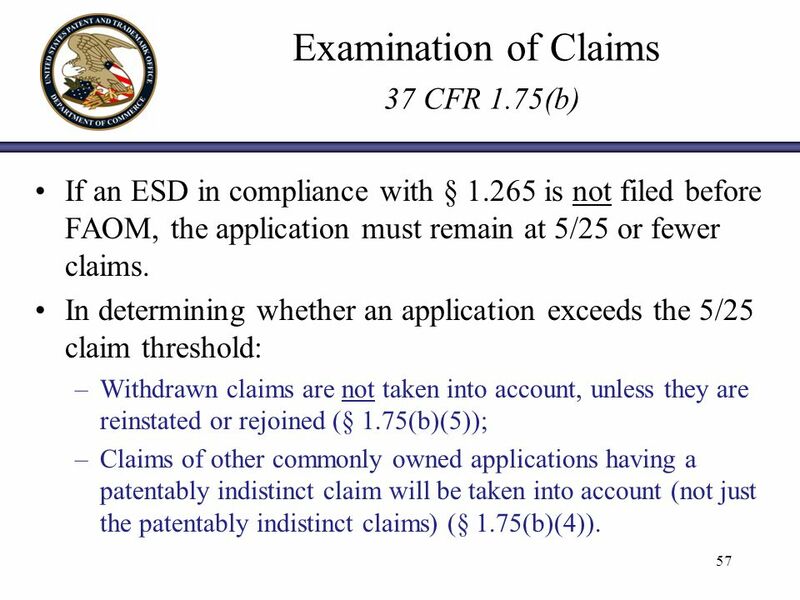 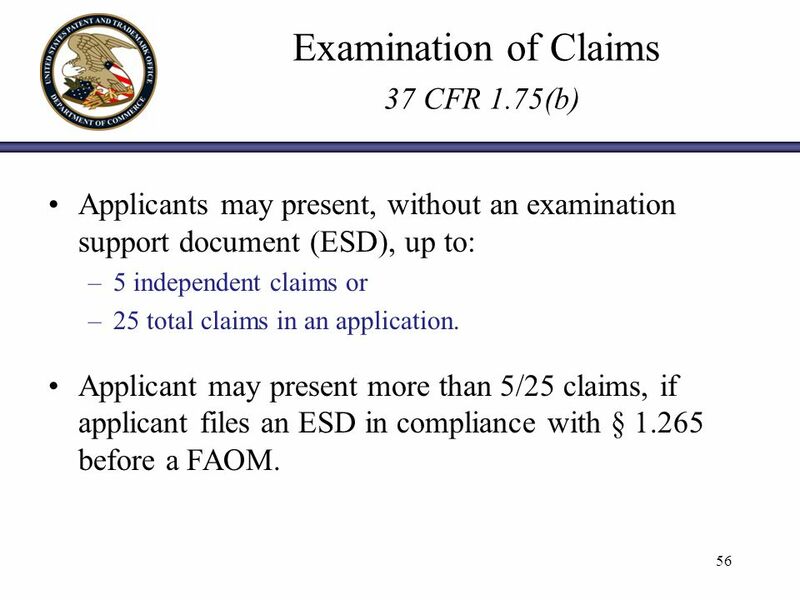 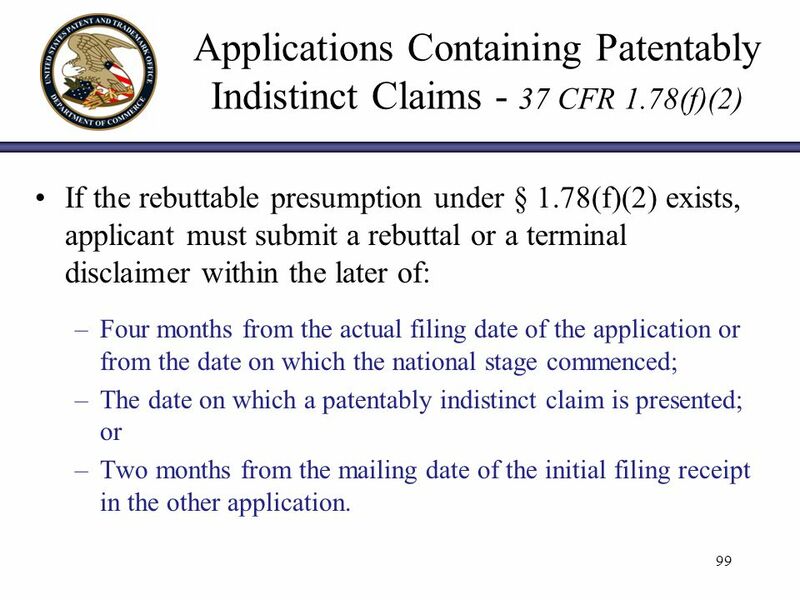 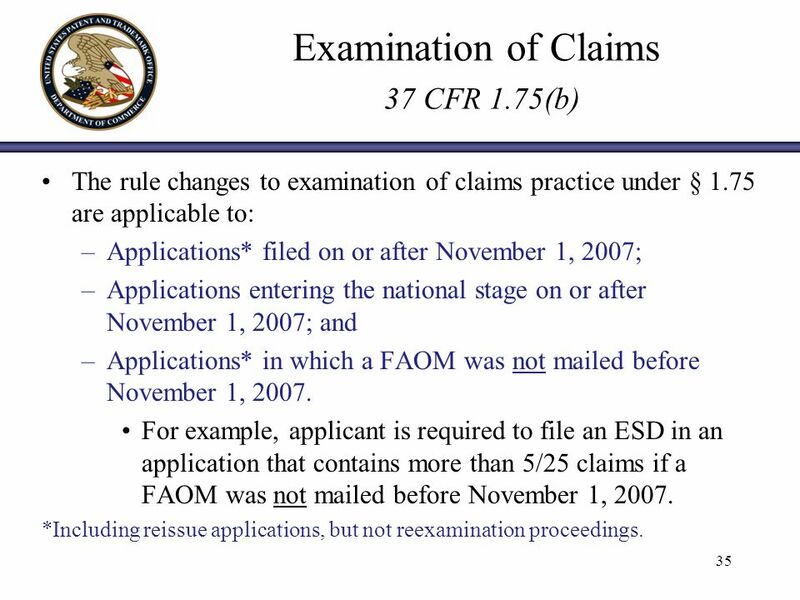 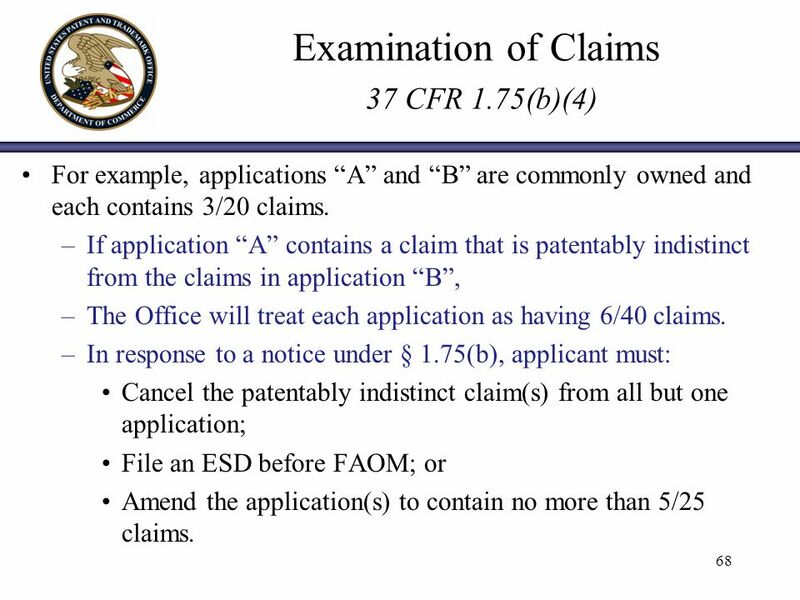 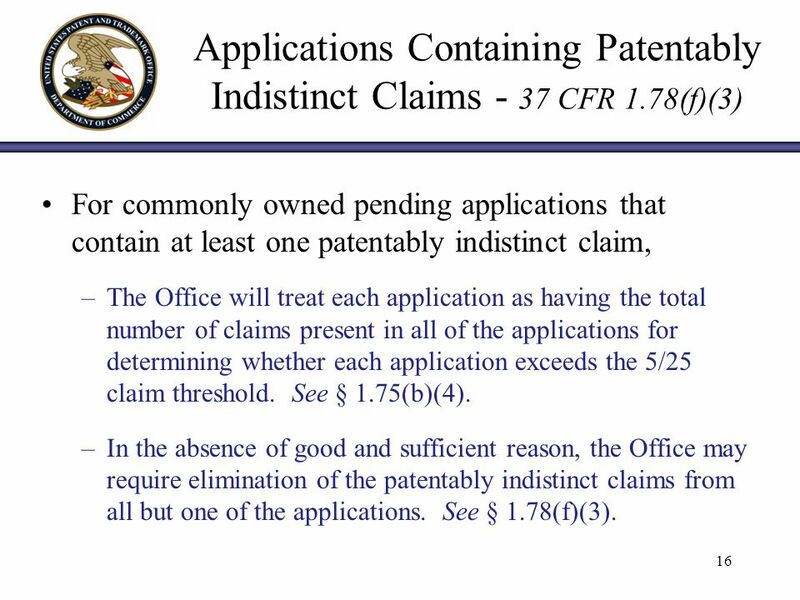 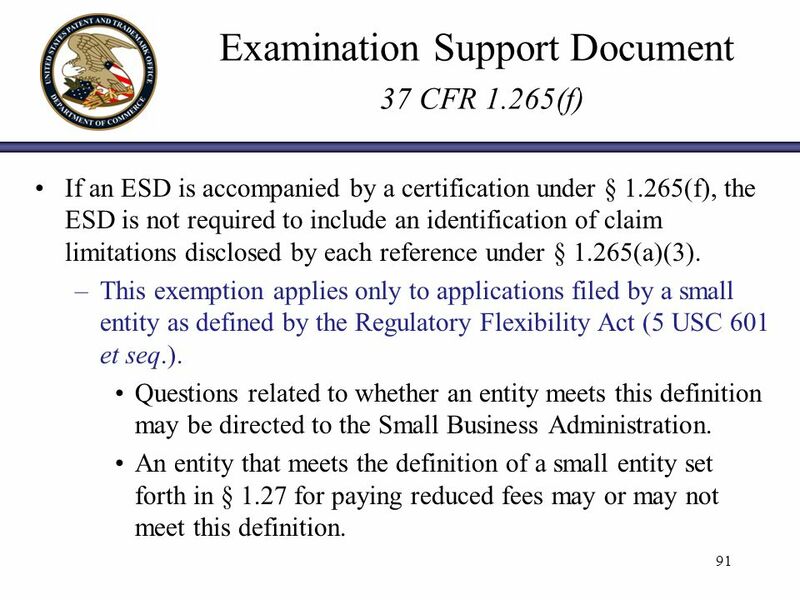 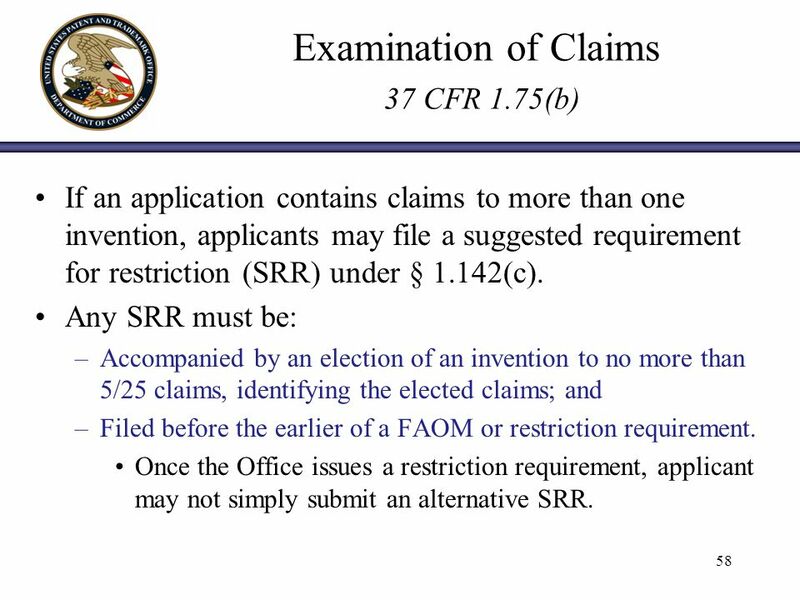 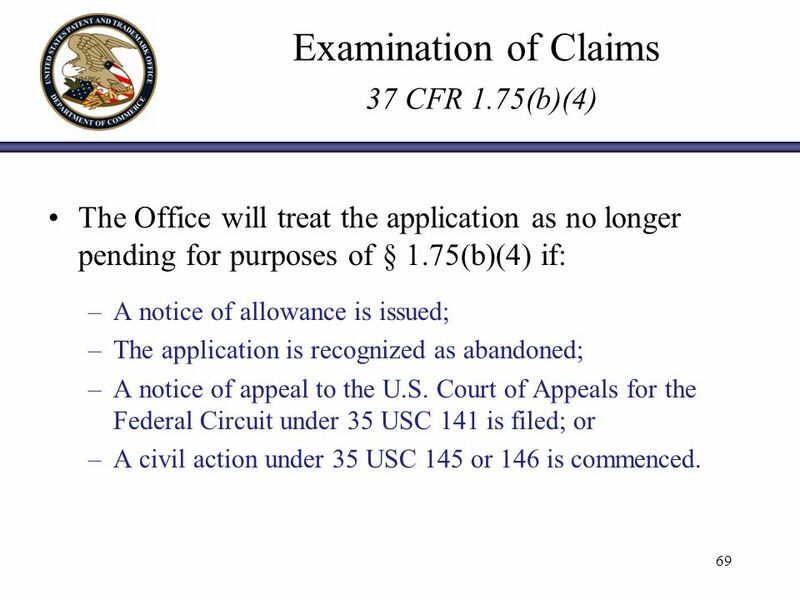 43 Continuing Applications 37 CFR 1.78(d) Any benefit claim to a prior-filed nonprovisional application must satisfy at least one of the paragraphs in § 1.78(d)(1) : 43 § 1.78(d)(1)(i) § 1.78(d)(1)(ii) § 1.78(d)(1)(iii) § 1.78(d)(1)(iv) § 1.78(d)(1)(v) § 1.78(d)(1)(vi) –Conditions for 2 CONs or CIPs of an initial application. –Conditions for divisional applications. –Conditions for 2 CONs of a divisional application. –Conditions for one more CON or CIP of an international application in which a Demand and the basic national fee have not been filed. 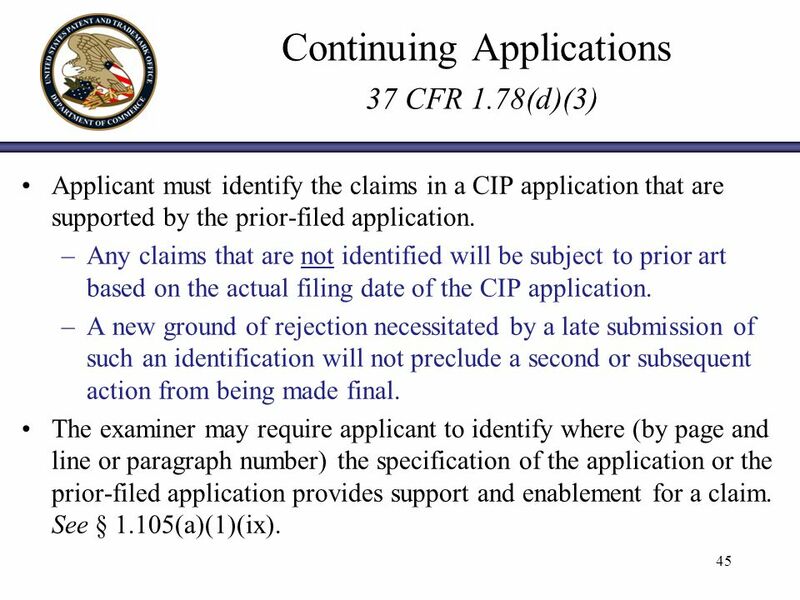 –Conditions for one more CON or CIP for a nonprovisional application abandoned in preexamination. 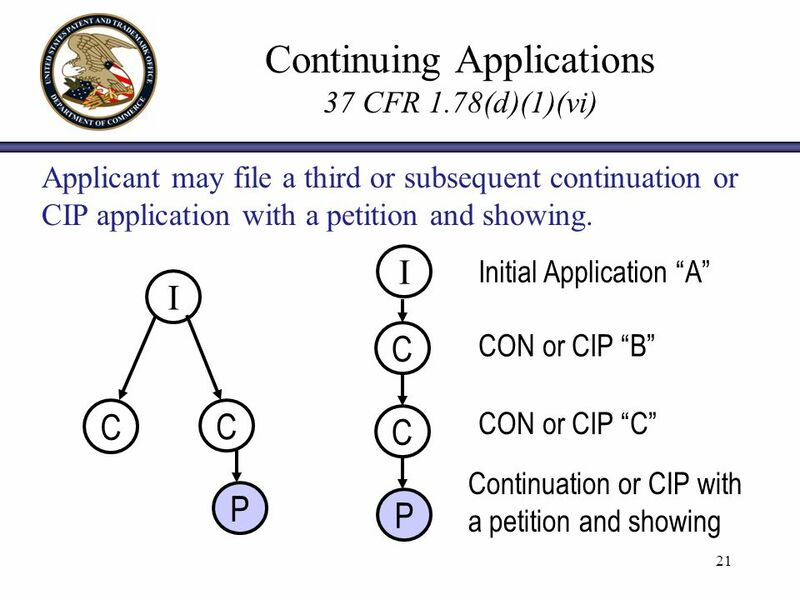 –Conditions for a third or subsequent CON or CIP filed with a petition and showing. 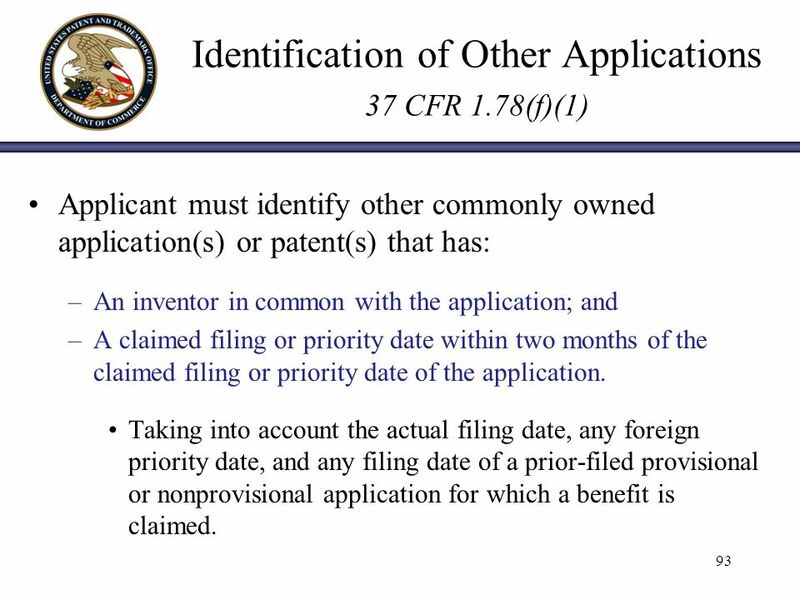 95 95 Identification of Other Applications 37 CFR 1.78(f)(1) For the example below, applicant for application A is required to identify application B and applicant for application B is required to identify applicant A because the foreign priority date of application A is within two months from the filing date of a prior-filed nonprovisional application for which benefit is claimed in application B. Application A Application B Actual FD 2 months FD of a prior-filed provisional app. 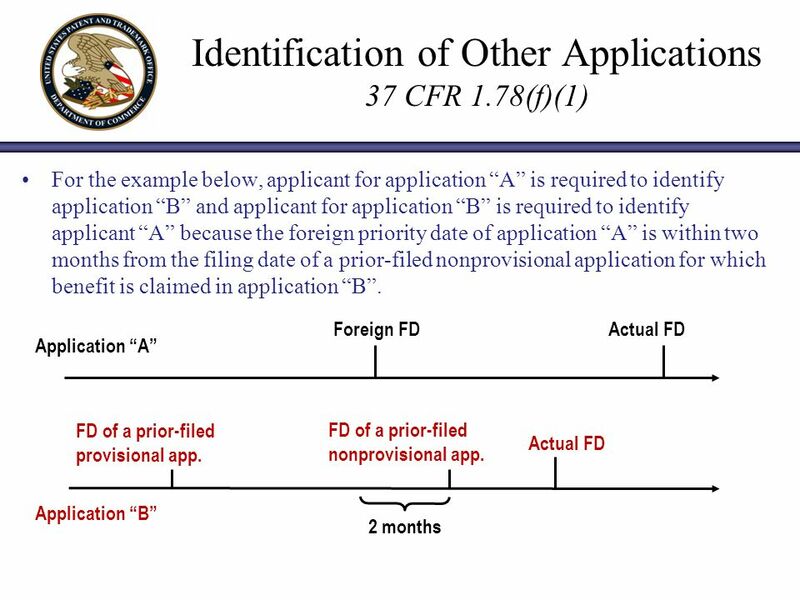 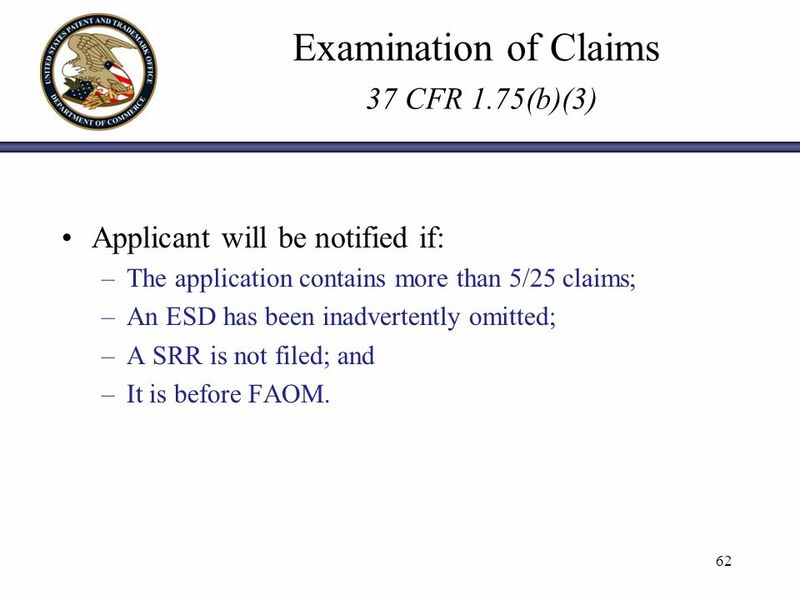 Foreign FD FD of a prior-filed nonprovisional app. 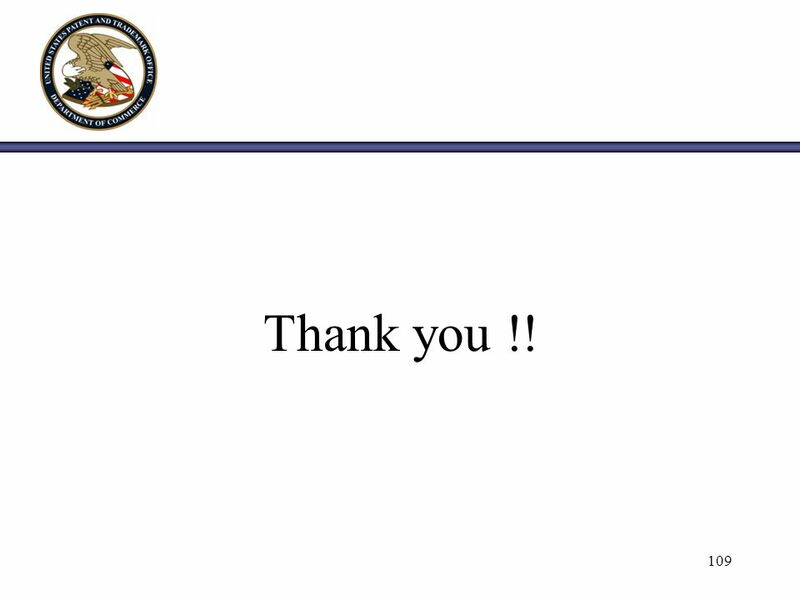 109 109 Thank you !! 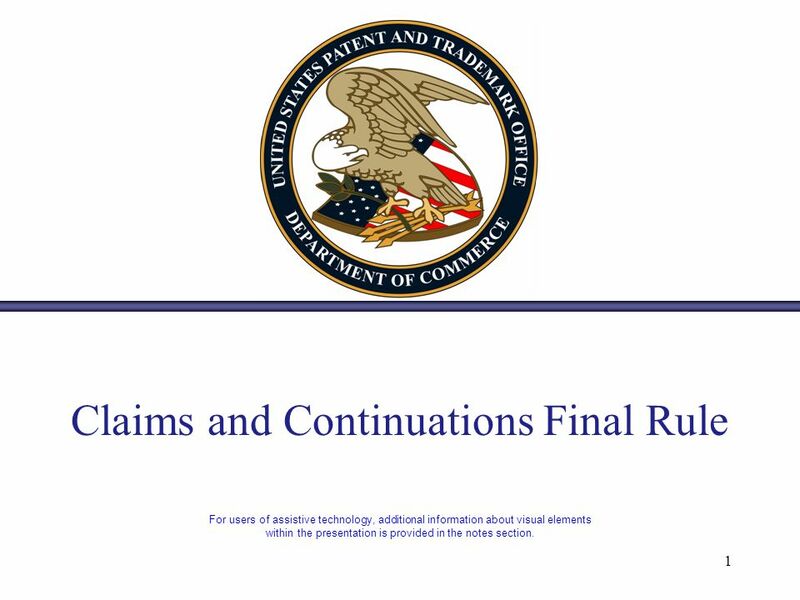 Download ppt "Claims and Continuations Final Rule For users of assistive technology, additional information about visual elements within the presentation is provided."